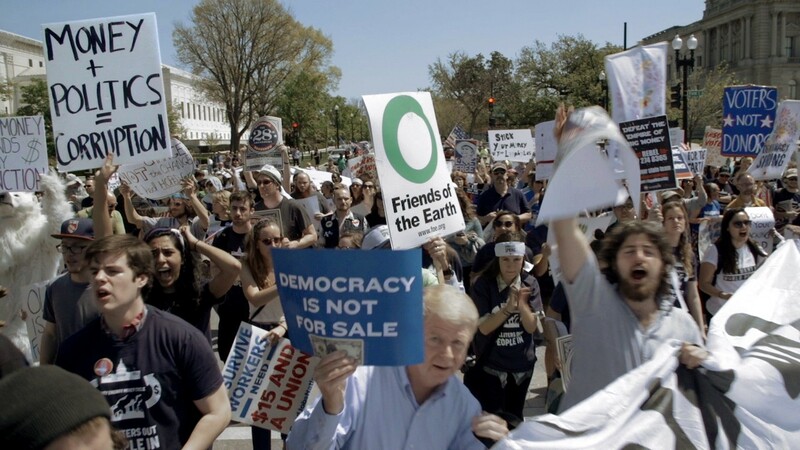 Protests against election tampering in Dark Money. Dead snow geese in a copper pit. That's what the state of Montana never wanted to see again. And that's why, as outlined in Kimberly Reed's bracing new documentary Dark Money, a few determined public servants have stood up and fought against corporations' predatory efforts to take over Montana's abundant natural resources. As reported around the world, several thousand migratory snow geese suddenly succumbed after drinking the heavy metals- and sulfuric acid-tainted water in the Berkeley Pit in Butte in December, 2016. The massive bird die-off was a terrible reminder of Montana's history as one of the country's regions most devastated by Anaconda Copper and like-minded seekers of mineral wealth over the years. According to many of the current and former Montana legislators, judicial figures, and commissioners interviewed in the doc, Anaconda at one time "owned the state," leaving a trail of ruined landscapes and political corruption that some — but not all — public-spirited individuals now regret. These days, the corporate villains are more likely to be associated with the notorious Koch brothers and various shadowy nonprofit orgs with names like Americans for Prosperity, American Trade Partnership, or the National Right to Work Committee, an anti-labor union PAC. Emboldened by the U.S. Supreme Court's Citizens United decision, big-money interests have poured millions into campaigns to influence elections all over America, using donations, smear tactics, and last-minute ad blitzes, with backers hidden from view in a complicated web of nameplates and out-of-state addresses. As Reed and her witnesses point out, Montana learned its lesson earlier than most, and even though a few elected officials have taken the dark money bait, a growing number of resolute Montanans are resisting, inspired by grassroots activism. Dark Money belongs to the "outrage doc" subgenre of public-affairs exposés. In the spirit of Mark Achbar and Jennifer Abbott's The Corporation, Ai Weiwei's Human Flow, Craig Atkinson's Do Not Resist, and Michael Moore's mega-popular Capitalism: A Love Story — to name just a few among a multitude — outrage docs aim to bring complex issues such as refugee migration, police brutality, and homelessness back down to the kitchen-table-discussion level that American social movements have always relied on to help solve our most "insoluble" problems. Socially minded writer-producer-director Reed (Prodigal Sons, The Death and Life of Marsha P. Johnson) strikes a sympathetic chord early in Dark Money by showing that the focus on fair elections and campaign finance reform originates at the neighborhood level. One of the film's most articulate subjects is John Adams, a dedicated truth-teller who, as the timeline progresses, moves from Great Falls Tribune staffer to lone-wolf investigative reporter living in his van to founder and editor-in-chief of The Montana Free Press, an independent voice for reporting on social justice, the environment, and community responsibility. Peekaboo election campaign finance has Adams worried. As corporate money steadily, quietly suffocates democracy, he states: "It's not the people controlling the government, it's a government controlled by a corporation controlling the people." And it's not only in Montana — we hear from voices in Wisconsin, West Virginia, Oklahoma, and Colorado as well. Dark Money is not showing in any theaters in the area.